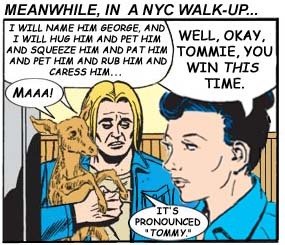 CC’s DOLz wonder aloud what the consequences might be (if any), were Mary Worth‘s druggie nemesis Tommy the Tweaker were switched with Apartment 3-G‘s nurse Tommie Thompson. Would anyone notice? Would anyone care? Let’s find out! …and the, The Big Night! This entry was posted on Sunday, February 23rd, 2014 at 1:12 AM	and is filed under Finger-pointing Goodness!, Most maryWorthy. You can follow any responses to this entry through the RSS 2.0 feed. Both comments and pings are currently closed.